Any fighter (Amateur or Pro) who commits to fight on ANY ISCF Sanctioned event is bound to their commitment. A fighter who pulls out of a fight event at any time inside 48 hours of their scheduled event, without a justified and provable reason such as medical or family emergency, personal injury, missed flight, etc. etc. will be suspended a MINIMUM of *30 Days for a Non title Bout and MINIMUM of 45 Days for a TITLE BOUT. Fighter's put on a "Disciplinary Suspension" and NOT A TKO, KO or any other "MEDICAL" Suspension will have the option to pay a larger Fine to avoid the TIME Suspension on "No Show" Suspensions. The Fine Increase Vs Time Allowance is NOT allowed for TKO or KO Suspensions. Fine Increase Vs Time Allowance is an "Additional" fee above the already established fine of $10 per day the Time Suspension is reduced. EX: Reduction of 10 days off a suspension would be $10 x 10 = $100.00 plus the already established fine. The total fine must be paid a minimum 24 hours prior to the fighters bout. Any and ALL Additional Expenses above $150 the promoter spent for the fighter who did not pull off the event. Any and all Travel Expenses of the fighter who did not pull off the event due to the person who paid them (Plane tickets, gas, hotel, by Promoter, Fighter, Manager, etc. etc. with proof of documentation - Receipts. Any "Special" Promotional Expenses paid by the promoter. Overall fine will be based on the lost purse of the fighter who did not pull off the event. a Pro fighter could very well be liable for the entire purse of the fighter they were scheduled to fight. Add additional time to their suspension. Add an additional fine for each infraction. Ban the Fighter from any role on any future ISCF event indefinitely as a Fighter as well as a Trainer, Cornerman, Official or Promoter. 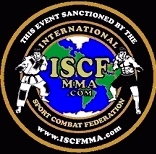 Any Fighter can be Fined and or Suspended for breaking any of the ISCF ILLEGAL TECHNIQUES AND FOULS OF A BOUT. These suggestions above are not the only reasons for Suspensions and Fines. Simply Respect and Common Sense shall be the determining factor of any Suspension and or Fine as determined by the ISCF Representative or the ISCF Headquarters after the event. Suspensions Remain & Continue Until All Fines Are Paid In Full. ALL Trainers at an ISCF Sanctioned event must abide by the below TRAINER - CORNERMAN - RULES & REGULATIONS. If not, they could be suspended and fined by the ISCF Representative who is overseeing the event. All Cornermen & Trainers must be a minimum of 18 years old. All Cornermen & Trainers working a fighters corner must be a LEGIT Trainer - NOT a friend and or family looking for a ringside ticket and better view. All fighters are allowed a maximum of three (3) Cornermen &/or Trainers at ringside while the bout is in progress. Fighters are allowed up to 5 Cornermen &/or Trainers for an "ISCF" Title bout. ALL Cornermen & Trainers are required to STAY in their fighter's corner (outside the ring or cage, of course) while the match is in progress. Warn the Coaching Corner that if they do not obey this request he/she will suspend them, fine them or worse yet, stop the bout. Have the Cornermen and or Trainer escorted away from ringside by security. Have the Cornermen and or Trainer escorted out of the building by security. Apply a Suspension on the Cornermen and or Trainer for a minimum of 30 days. Apply a Fine on the Cornermen and or Trainer for a minimum of $100.00. Deduct a point from the offending Cornermen or Trainers fighter. End the bout, awarding the entire bout to the opposite fighter. - Disqualify the offending Cornermen or Trainers fighter. Cornermen shall stay OFF the ring floor/canvas etc., while the bout is in progress. NO LEANING ON THE RING OR CAGE! During the round breaks, only one cornerman is allowed in the cage/ring while the other two can stand outside the cage/ring on the outside edge of the cage or on the floor. Cornermen must obey the referee at all times during the match. Cornermen must conduct themselves with appropriate and proper sportsmanship in all ways connected with the match. Cornermen may spray (not pour) water and apply ice to a fighter between rounds. No other substances may be applied between rounds, and the cornermen are responsible to dry the corner area before the next round commences. Violation of the rules by corner personnel can result in warnings, point deductions, and/or disqualification of that corner's fighter along with suspensions and fines as suggested above. ALL Trainers and Cornermen working on an ISCF Sanctioned event must conduct themselves with appropriate and proper respect to ALL ISCF Ring Officials. Any "Unacceptable and Unjustified" rude or disrespectful behavior of ANY kind that occurs by a Cornerman or Trainer working an ISCF event will result in a minimum fine of $250.00 up to $2,500.00. In addition, if such a violation occurs, the ISCF has the right to suspend the Trainer or Cornerman from working as a cornerman for up to 12 months in ANY MMA event worldwide. Ban the Trainer from any role on any future ISCF event indefinitely as a Trainer or Cornerman as well as a fighter. At the end of all ISCF Promoter Applications - Example found HERE.